VIDEO: Louisville Basketball Player Who Broke His Leg Returns, Hits Shot : The Two-Way Kevin Ware suffered a gruesome injury during last spring's NCAA men's basketball tournament. He reacted with a confidence and sense of humor that won him many fans. Now he's back on the court. University of Louisville basketball player Kevin Ware, who went down with a gruesomely broken leg during last spring's "March Madness," returned to the court Wednesday night. 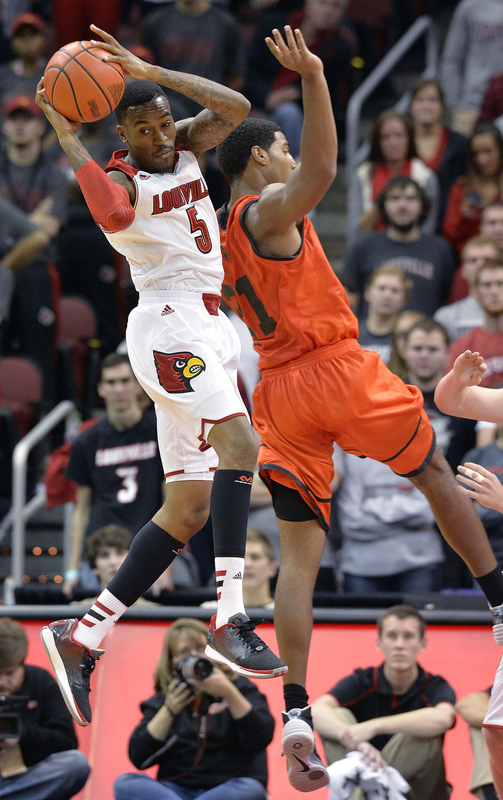 Louisville's Kevin Ware, in the white uniform, was back in action Wednesday night. He returned to the court for the first time since breaking his leg last spring. The junior guard came off the bench during his team's exhibition game against the University of Pikeville and about 5 minutes later hit a 3-point shot. As The Louisville Courier-Journal reports, "the KFC Yum! Center crowd of 19,227 lost it." You can see and hear the reaction in this video. Last spring, Ware reacted to his injury with the kind of humor and confidence that brought him many fans. Check out his April appearance on The Late Show with David Letterman. Among the "top 10 thoughts going through Kevin Ware's Mind" when he broke his leg was: ""Hey, look — my tibia!" "Ware grabbed a rebound, brought the ball upcourt and attacked. "He swirled into the lane, into traffic and trouble, and he was fouled hard. His body — including that right leg — smacked against the floor. The fans went silent. And then Ware stood back up and made a pair of free throws.
" 'I'm fine,' Ware said [later]. 'I'm Kevin again.' "
Louisville won Wednesday's game, 90-61.